T he Dutch Young Ladies Club is part of the VERON (a Dutch Radio Amateur Society) and was founded in 1981. The ladies formed a contestgroup, starting in 2012. Their slogan is ‘Proud 2B PI4YLC’. On various occasions PI4YLC has been active at the conteststation of PI4TUE and also at other locations. 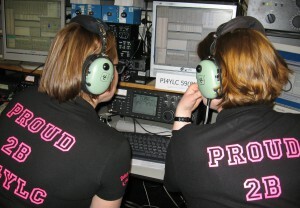 Purpose is to enhance (contest)skills, learning more about radio operation and having fun! Besides contesting, PI4YLC also engages in other HAM­radio activities. The ladies have been guestoperators on the Steamship Rotterdam (PI4HAL) and participated in the International Lighthouse and Lightship Weekend (ILLW). More information can be found on this website. A presentation about the Dutch Young Ladies Club, the contestteam and the other activities will be held at several divisions of VERON throughout the country. I am Chairmam of BYLARA and would like to ask if you or your Group and in fact the Dutch Ladies in general would be interested i an Event which is happening in 2016. I am organizing the IYL Conference (International Young Ladies Convention) to be held in Great Britain in 2016. Arrangements are already in hand and would like to know if you think thee would be any interest by yourselves or your country. If you are interested or you know of anyone who is please contact me on the email address I have given. Thank you for your time and very pleased to make your acquaintance and look forward to further contact with you all. CQ ham radio… mail from Japan! PI4YLC in RDXC with nine YL operators! March 2018 will be our month… with an YL-award! Dennis De jong on CQ ham radio… mail from Japan! Lex PH2LB on March 2018 will be our month… with an YL-award!